Continuing the build of MC cartridge preamps I decided to tackle something different. In this build a Jean Hiraga MC preamp schematic was used. Jean uses low noise bipolar transistors instead of jFets. He originally used discrete low noise transistors which are no longer available. But what is available is even better. In a single eight pin chip (SSM2220) two low noise, perfectly matched, transistors share a single substrate. The $AU11.00 chip, when used with a socket, makes construction and maintenance very easy. I use gold lined Mil-spec chip sockets. WBT 5% silver solder is used throughout. 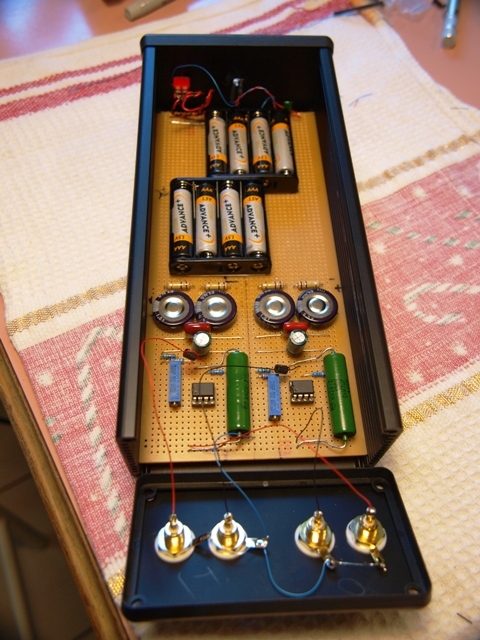 Construction is on veroboard and the enclosure is a Hammond anodised Al type. Where Mr Hiraga likes to run all devices from car batteries with huge capacitors I settle with a total of 1F (1000,000uf) of capacitance and 8 X AAA batteries all onboard. The batteries supply +/- 6V. To maintain even battery discharge and to guarantee all four 1F caps get equal voltage loads a resistive network is used. The capacitors are in series to meet voltage level requirements (4 X 1F @ 5.5V). Additional caps are added: 220uf low ESR and 0.1uf to ensure good midrange band pass and snubbing of noise. 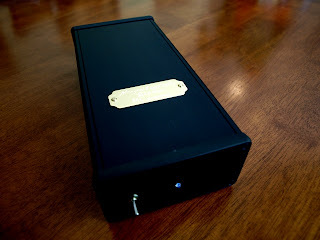 Oatley/Mongrel Dog Audio - JFET phono preamp cct.